Heading out on a long vacation? Moving? Or is it just time to clean out the refrigerator? No matter what the reason, there are days when you need to use up the food in the fridge, and re-heating those leftovers just doesn’t sound appealing. Can food be made just as appetizing – or even more so – the second time around? (This has been a big question on our minds because we’re moving over the weekend and we’re trying to empty out the refrigerator as much as possible before the big day.) The answer is “yes” if you know how to make “kitchen sink” foods – i.e. creative ways to use up just about everything in the kitchen sink. 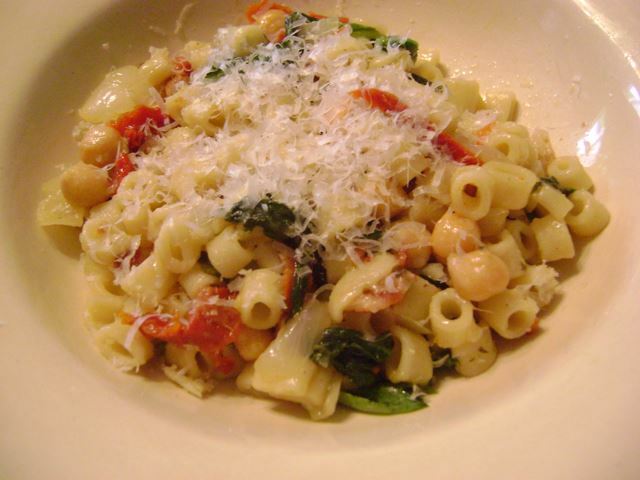 Pasta: Pasta is a great food companion. By that we mean it’s happy to be paired with just about anything. Do you have too much spinach in your fridge? Saute it in some olive oil and toss it with pasta. Leftover rotisserie chicken? Tear it into pieces and toss it with pasta. Extra chili? Serve it over a bed of…you get the idea. We made this pasta dish by sauteeing onions, fresh spinach, chopped sundried tomatoes, garbanzo beans, and leftover crumbled cooked bacon. We stirred in some cooked ditalini pasta, put in a splash of white wine, simmered it for a few minutes, and voila! Instant confetti pasta – and it helped us empty out at least three different containers in the fridge. Fried rice: We love making fried rice to use up leftover rice – and to use up those eggs. Heat a little butter or oil in a large pan, add chopped veggies to cook, then add the rice and mush it around so it de-clumps. Once the rice is warmed through, add one or two scrambled eggs, and cook, stirring frequently, until the egg is solid. 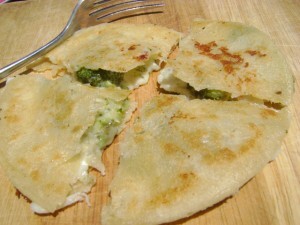 Quesadillas: The great thing about quesadillas is that you can hide just about anything inside. All you need are the basic staples of tortillas and cheese. We made these “broccodillas” with a mixture of leftover mozzarella, cheddar, and Monterey Jack cheeses, plus some steamed broccoli. 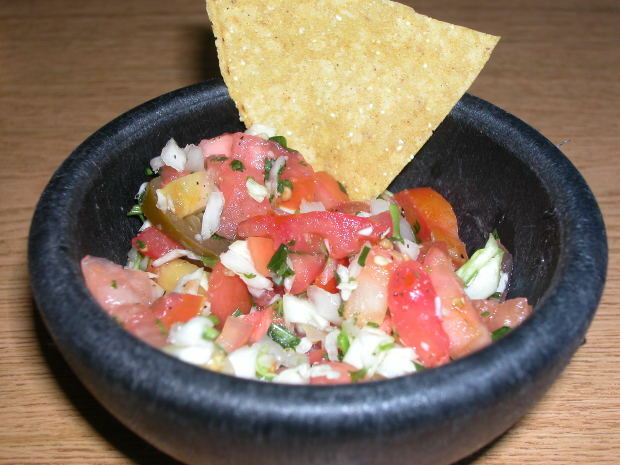 Salsas: This is another super-sneaky way to use up fruits and vegetables. It helps if you have some fresh onions or spicy peppers, but there’s pretty much no limit on what you can combine. 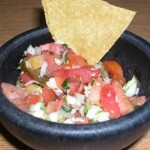 We’ve had watermelon-cucumber salsa, mango-bell pepper salsa, tomato-orange salsa…the list goes on. Plus it’s a good way to use up those half-eaten bags of chips. 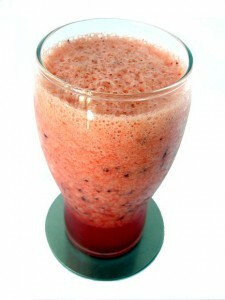 Smoothies: Ahhh, the good old smoothie. Of course we make smoothies to use up milk, yogurt, bananas, and strawberries. But we’ve also been known to toss in tofu, peanut butter, hard-boiled eggs, or just about anything that will blend up smoothly and neutrally. Bonus tip: If you have just a small amount of jam left in a jar, add that to the smoothie to give it a little more color and sweetness. Frittatas: Have a lot of eggs? Make a frittata. It’s basically the same idea as an omelet (lots of goodies in an egg) but with a frittata, the goodies are mixed in along with the egg mixture (rather than folded in) and the frittata bakes in the oven after being partially cooked on the stove. 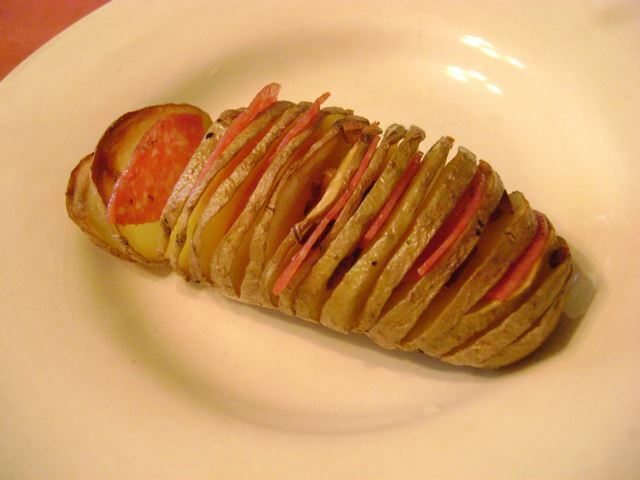 Start by sauteeing or reheating whatever ingredients you want to use in an ovenproof skillet (onions, potatoes, bacon, ham, carrots, celery, peppers, etc. ); pour in a few well-scrambled eggs; cook in the pan until the bottom of the egg mixture is set; then finish by baking it in the oven at 350 degrees for 10 to 15 minutes, or until the center is firm. Is your refrigerator empty yet? We’ve got more boxes to pack, but we look forward to hearing what everyone else cooked this weekend. Happy cleaning, and happy weekend to all! Smoothies….good point! That’s usually my go-to “clean out the freezer” technique. Great for breakfast on the go! Agreed! Thanks for stopping by, Kristina!